OpenTTD is an open source remake and expansion of the 1995 Chris Sawyer game Transport Tycoon Deluxe. It is an "Urban planning and simulation game". 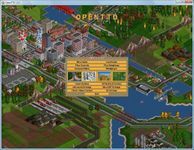 OpenTTD duplicates most of the original game's features but also has numerous additions including bigger or smaller maps, a multiplayer capability, improved language support, custom AI support, and ports for several commonly used operating systems. It offers LAN and Internet play via public and worldwide servers for up to 255 players. OpenTTD also includes numerous usability improvements not present in the original Transport Tycoon Deluxe.